There are many area attractions and things to do in the Sandy Creek and Pulaski area other than swimming, boating, fishing Salmon River, Sandy Pond, and Lake Ontario. Auto racing, bird watching, fish hatchery, fairs and festivals, historic sites, shopping malls, theaters, restaurants, go karts, scenic areas , flea markets: all these things are close to our Sandy Pond cottages on Lake Ontario. Many 2008 opening dates are unavailable to us as of now. We will post them as we discover them. Fulton Speedway - Big block modifieds, sportsman, pro stocks, pure Stocks and 4 cylinder enduro racing all beginning in April. For details go to www.fultonspeedway.com. 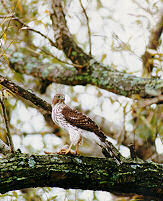 Birding on Derby Hill - Bird observatory on Lake Ontario is well known for viewing spring hawks and other species. Stone Mills Craft Show - NY Agricultural Historical Society grounds, Rte. 180, Lafargeville. First weekend in August. 200 crafters. Hillside Antique and Flea Market - Route 3, Open weekends from Memorial Day to Labor Day. Just 6 miles from cottages. Tri-R Karts Super Golf - Pulaski, route 3, 9 miles south of cottages. Also offers miniature golf course. Sackets Harbor – Charming town and historic battle grounds. There are many, many restaurants and snack shops of varying price ranges from Pulaski, NY to Watertown, NY. Popular ones for vacationers are found on Sandy Pond, Lake Ontario, Henderson Harbor and Pulaski, NY. For your convenience, a book including area restaurant descriptions with maps and driving directions is kept at our Lake Ontario cottage rental. 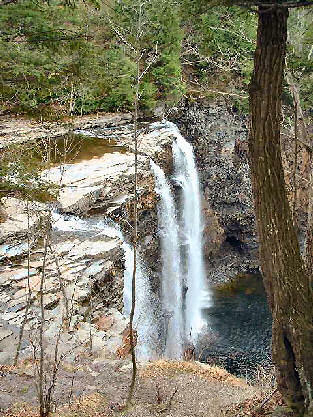 Salmon River Falls - A spectacular fall that drops 110 feet. It is located on Salmon River east of the fish hatchery. Montario Point Lookout Tower - enjoy a view of Lake Ontario, Sandy Pond and Lakeview marsh from this 40' high tower. Especially nice at sunset. Only1.5 miles from the cottages.